When I was in Clarksville Kroger's store last Thursday, just before Easter, I took time, as I always do, to look at their beautiful flowers. 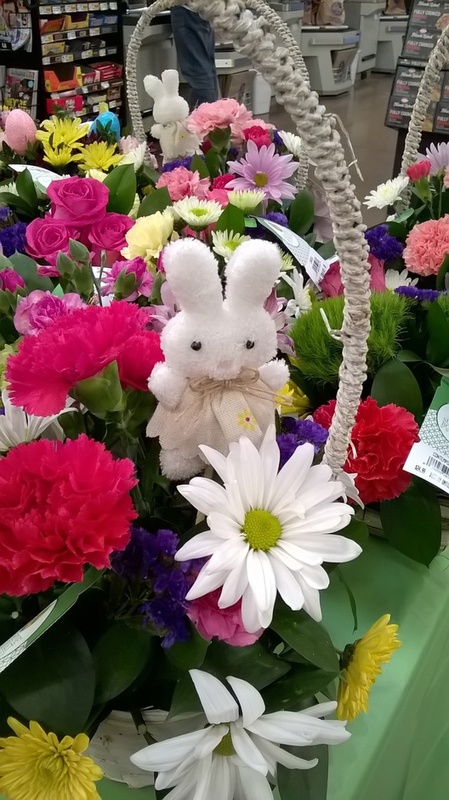 They had lots of spring flowers and also a whole table of Easter baskets with flowers for sale. One of the other girls told me that Cherie, the flower girl there, had transferred to work at the Kroger's store in Jeffersonville. I used to always visit with Cherie when I was in the store and she always let me take photos of her beautiful flowers. I will miss her. 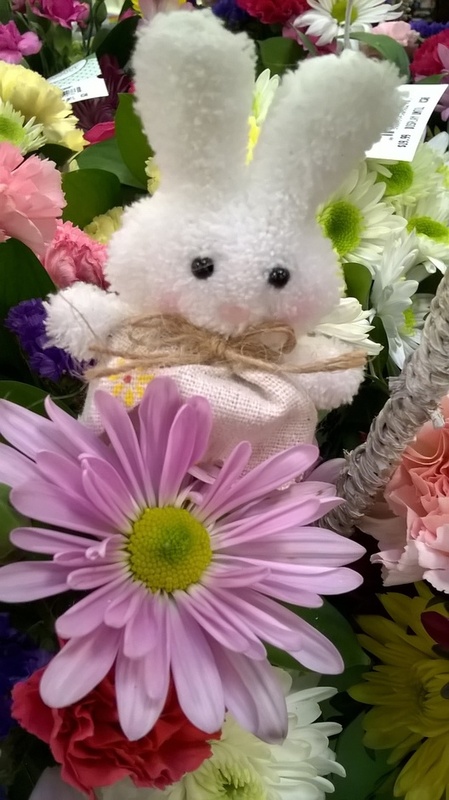 I took many good flower photos when I was in the store Thursday and am posting a couple of the best ones here on the April blog for Easter. I also found out, after checking the Kroger sale bill online when I was making my weekly shopping list, that they are now delivering groceries for a fee of $11.95. You have to order at least $35 worth of stuff to have it delivered. You can shop and pay online and they will now deliver them to your home! This is only in certain areas, and Clarksville is included, but there is a place on the website to find out if they have this service in your area or not. If they have it a few places, it will soon probably be everywhere and probably also other stores will be doing this too soon. Guess they're all figuring out that just offering to let people shop online, but they still have to have a car to pick up merchandise at the store, isn't working out as well as they thought it would. Not with Amazon as competition! I haven't checked this out much yet, but from what I saw on the website, the prices seemed to be the same as at the store, and they had store brands too, not just name brands. There seemed to be a good selection of items also. From what little I checked out so far, I guess they are outsourcing this to a company that hires personal shoppers to shop for what customers order and then deliver it to them at a specified time. The delivery option, along with more information about this is at the top of Kroger's home page on their website. It appears to me that if you couldn't get to the store it would be well worth the $11.95 for delivery. The only problem I can see is that a lot of the people who would need this service would be older people who no longer drive, but they would probably not want to use computers to order anything either. So it wouldn't help them much. However, it is a step in the right direction. When I was a little girl there were a few small neighborhood stores who still delivered groceries. Richardson's Grocery was able to stay in business for many years after the big supermarkets started replacing the small stores because a lot of the older people who couldn't get to the store knew they could pick up the phone, call in their order, and Richard, the delivery man, would deliver it to their home. So it looks as if this way of business is slowly starting to come back, although the younger people who don't remember those days, think it is new. C. B. and I are on our first picnic of the year. Would you believe we had to borrow a stove from Gilkey’s this morning. C.B. was trying to fix ours and a piece broke off. Will buy a new stove next week. How else can the great “chef” cook this summer? We are at Burn’s Hollow Rest Park near Borden, Ind. I am sitting here under the little shelter that houses the old water pump in this park. C.B. is cooking chicken for our lunch. I went looking for wild flowers down along the creek a little while ago. Did I tell you of my “Cathedral of the Woods”. No stain glass windows or vaulted ceilings, or organ music in this church of mine. A blue arch of sky—Soft sunlight filtering down through leafless trees, gentle sound of wind and rippling water my organ music in this church where I walk with my Lord on Easter Day. I hear His voice in the tall pines on the hill. I can see His beautiful work everywhere. Clear, sparkling water of the stream and all the little wild flowers along the banks and in the woods. I wade in the clear, cold water and search the banks for flowers. Not to pick, just to look at them. So lovely they are—Spring beauties, Dutchman’s Breeches, & Deep maroon colored Wake Robins. Ferns & mosses of every kind and many, many more flowers. So beautiful here it is like slipping away from the cares and problems of civilization for a short time. Enchanted I watch the gold fish as they swim. NOTE by typist, Mary Hazel Upton. 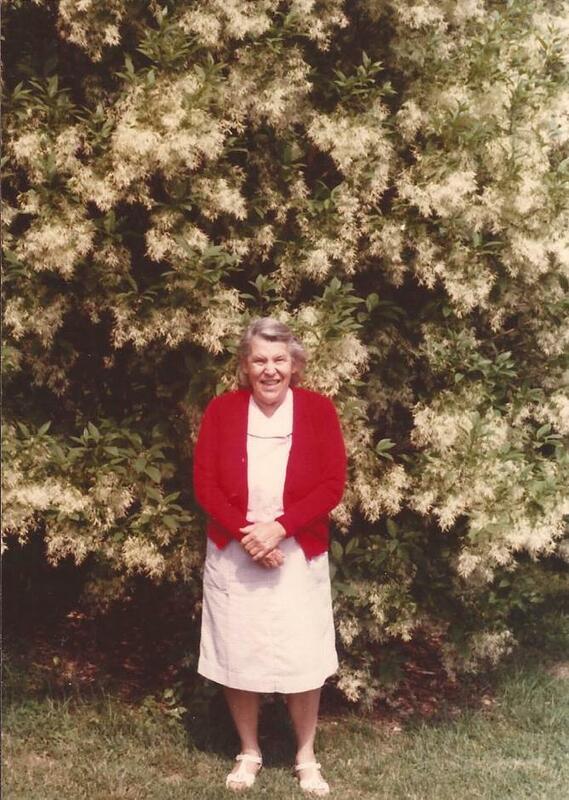 These diary entries and the poems, “Gold Fish” and “Apple Blossoms” are typed up from the originals in Mama’s very old diary and her poetry book.The poems were untitled in her poetry book. I also made very minor corrections of paragraph spacing in the diary—she had it all as one paragraph in her hand written book. I made very minor punctuation corrections in the diary and poems also. Otherwise, everything is just as she wrote it. The old apple tree in the poem was in the neighbor’s yard across the street from her house. Dollar Tree always has lots of holiday and seasonal decorations. I bought these bunny shelf setters a few years ago and had them on my kitchen window sill that spring. The forsythia flowers were from my yard. I had accidentally broken off a small branch of the flowers when working in the yard, so brought them in and put them in water to last as long as possible. I never pick flowers, preferring to enjoy them outside, but if I accidentally break one off, I bring it in the house. Dollar Tree never has exactly the same seasonal decorations each year, usually having the same things, but changing them just a little so people will want to buy the new ones. (I usually buy the new ones and now have so many of the various holiday decorations, both the original old ones and the new ones, that they have to be rotated, each taking their seasonal turn!) The Easter things are gone now, but check the store next year for Easter bunny decorations, which will probably be similar to these. Dollar Tree is also getting lots more groceries of various kinds and you can't beat their prices. There is a lot on their website and, of course, everything is the same price as in the store, $1.00. You have to pay for delivery, but they have an option if you want to pick up your order at a local store, you can avoid paying postage on your order. I haven't checked that out much, and will report on what I find out more later. I am researching online grocery shopping now, but have just started that research. This month I plan to start ordering a few canned goods from Dollar Tree, enough to stock up for awhile, saving trips to the store, and see how that works out. I would be in town anyway, and would want to shop in the store "for fun", but it would be convenient to order canned goods in quantity and just pick them up when I was in the store. That would not only eliminate some work shopping for them, but often the store is out of enough of what I want to stock up on. Their truck comes in on Friday here in Clarksville, and my shopping day, which I don't want to change, is on Thursday. Shopping online would also be a good idea if you wanted to buy holiday and seasonal things like these Easter bunnies. They go fast, but the online shoppers get advance notice of them being available and can order them. This is just a short note to let you know everyone here is O.K. Monday I started to dig up the sewer line. The first day I dug ten feet. The second day I only dug seven feet. Each day it got worse, the roots of the bushes and Con Con’s tree got so bad I had to get a axe, to cut through the roots. Today we went to the river at New Albany and took a few pictures. When stopped at White Castle got us some hamburgers and drove up I65 eating them. We went to Henryville Forest. It was almost like a Ferry Land. The snow made the tree limbs hang almost to the ground, The snow was wet when it fell and stuck to the sides of the trees. It was very beautiful. It won’t be long until we will pay you a visit. I hope the reservation that we made is still reserved. If not let us know. We was glad to see you March 8th. I hope you had a nice time on your trip to Va. I hope all the brothers was O.K. When we come up we will bring the desk. If I hadn’t forgot about the campground at Turkey Run I would have brought it up then. I will close for now and we will see you soon. Note by typist, Mary Hazel Upton: Hazel and Claude are my parents. Gain is my husband. Con Con is Connie, who used to live next door to Mama and Daddy. 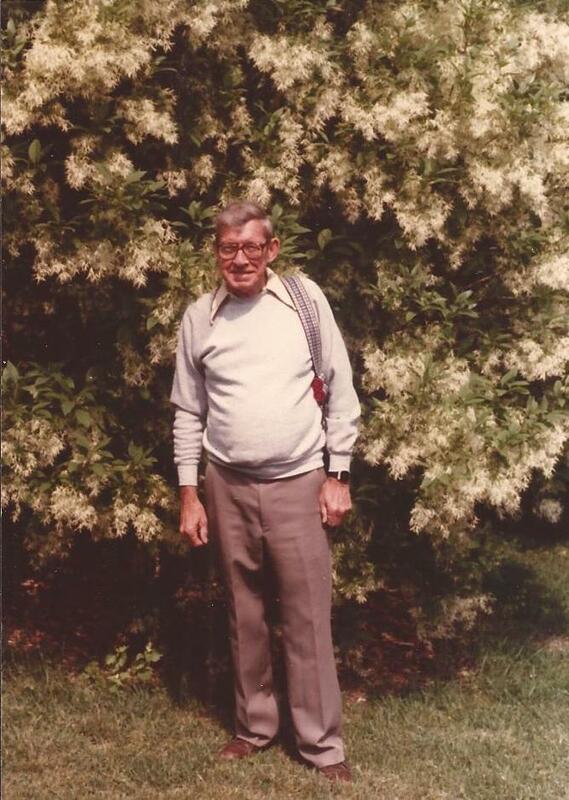 After Mama died and left everything in her house to me, I found that she had carefully preserved all of my old letters to her and Daddy and also old letters that my brother Charles and his wife, Anna Marie, wrote to her, as well as letters, cards, and diaries from other relatives. Most of them are very old. They are in her Sewing Room, what I now call the “Time Machine Room”. I also have a few of hers and Daddy’s letters to me that I saved in books. Mama wrote all of her letters by hand, as she did not use the computer. Daddy always typed his up on his computer and also saved copies for himself. I typed this letter up just as he originally wrote it except for a few minor spelling corrections. i left his spelling of Fairy Land as Ferry Land, the way he originally wrote it. The reference to the “reservation” was Mama’s and Daddy’s and mine and Gain’s long standing private joke. When they came up to visit us, they said they were making reservations at the “Upton Motel” and when we visited them we made reservations at the “Henson Motel”. The Motels room “rates” also included meals, laundry, and “entertainment”, in the form of slide shows (at the “Henson Motel” only as Mama took a lot of slides) and special videos saved for the visit (by both of us). There were also planned sightseeing trips to local tourist places and meals in restaurants during our visits. The “Upton Motel” also had “camping rates”, in the summer time only, in the old house. The old house was the one Gain and I had on the Wheeling property, where we lived at one time. We had hoped to be able to fix up the house and live in it, but it was too far gone for us to do that, so we ended up moving a mobile home onto the property to live in. The old house, by the way, is the same one that Curt and Mariette are fixing up in my story Nightmare House that I am serializing in this blog. Mama especially enjoyed camping in the old house. Of course, there was no actual charge for either of the "motels" or for camping in the old house. Daddy, when Gain and I were first married, tried to pay for everything, sightseeing trips we'd planned, eating out, etc.. Even after I left home, I was still his "little girl" and when I visited he would not let me pay for anything, of course. After I was married, he wanted to continue doing that for Gain and me both when we visited. Gain solved that problem by making the rule that when we visited Mama and Daddy they could pay for everything and when they visited us, then Gain paid. The reference to Va. is about a trip Gain and I took to visit his brothers and father, who lived in Virginia. I am typing all of this material up, as I have time, to preserve our family history. Genealogy is useful, and some of my relatives are into that, but most genealogy is just a few dates gleaned from old grave markers or records. That is all that is left of most people’s lives because nobody saved anything of theirs after they died. I am trying to preserve more than that by typing, and eventually publishing on the Internet, the old letters and diaries. Both of these old photographs of Daddy and Mama are from one of her old books of vacation photographs they took. They went many places, especially after Daddy retired, and took many photographs. I scanned these into the computer to publish here. I will be publishing more of their photographs on my blog as I get more of them scanned. Here are a few more photos that are suitable for an Easter post, although they weren't taken at Easter. The first two are of Gain's plastic rabbits. I seem to remember that Mama originally had some of these plastic rabbits and that Gain saw them when we were visiting and wanted some also. We looked everywhere for them, but he could not find any. We searched all over Clarksville and continued searching for them in all the stores after we got home. I think that Mama finally found some like them and brought them up for him as a surprise one time when they visited. I may have the whole account of "The Great Rabbit Hunt", as we afterwards called it, in my old diaries and when I get time I will look for it. If I find the account later, I will publish it along with these photos again. 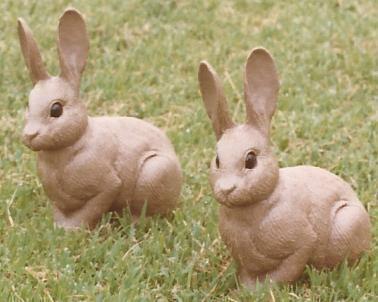 I do remember that Gain was really happy about his rabbit surprise and kept the plastic rabbits in the yard as decorations for years until they finally wore out. And finally, here is Hammerhead's "rightful" part of the blog with his photo and also a map he drew on a Wendy's napkin one day when we were having breakfast at Wendy's. The napkin was the only paper he had available when he started explaining to me where he had lived when he was a boy and wanted to draw a map. He was from down in the Ozarks. I kept the original map he drew for me and also scanned it into the computer so it would be permanently saved. The photograph I am publishing this month is of a much younger Hammerhead than when I knew him. It was one of the few photographs that he still had. Over the years his photographs had gotten scattered out and lost. I borrowed it, along with a few others he still had, and scanned them into the computer to save. 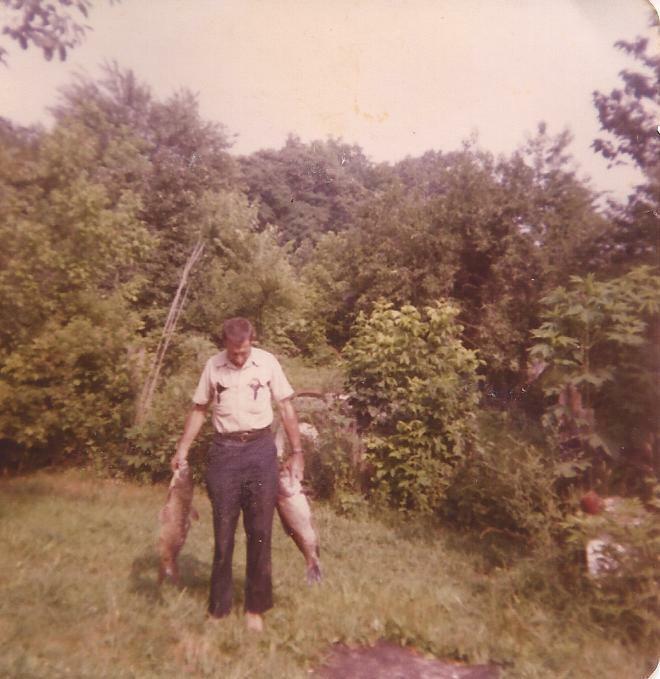 He is obviously somewhere down in the Ozarks in this photograph. The Ozarks of Missouri and Arkansas, where he is from, are farther south than The Cumberlands down in Virginia, Tennessee, and Kentucky, where Gain is from. I haven't seen the Ozarks, but can tell from the photograph that it is the same kind of wild beautiful country as where Gain is from. We went back to his home to visit his relatives as often as we could. I am still working on Hammerhead's book of his life story and haven't started the genealogy research of his family history (he didn't know much about his ancestors, as most people usually don't), but I think he told me that he left the Ozarks for the same reason that Gain came up North, to find work. There aren't many good jobs in the South, so that is the reason most people leave. Nobody from the South usually leaves for any other reason, and if they can possibly get back someday they do. 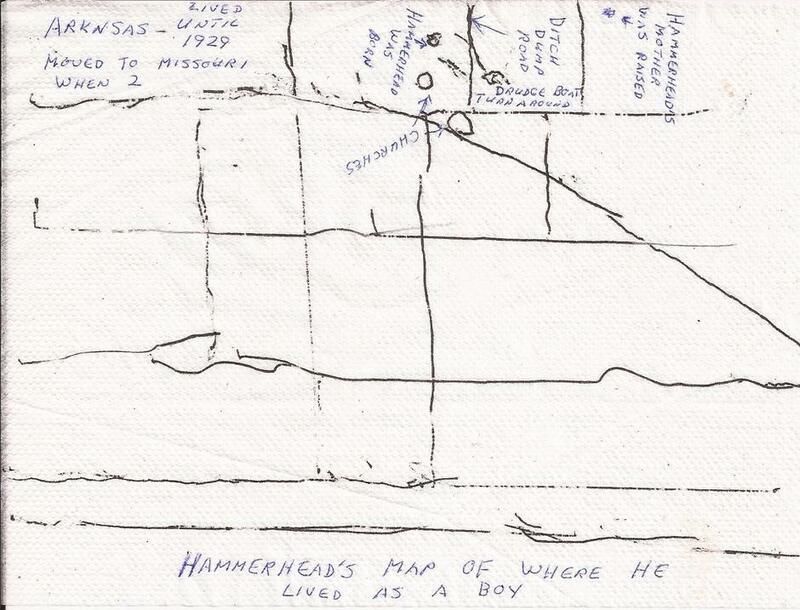 Hammerhead drew this map one morning at Wendy's here in Clarksville on a Wendy's napkin. He explained where each place on it was and I labeled it so that I could keep the map and remember what he'd told me. He was born in Arkansas, but the family moved to Missouri when he was just a little boy and that's where he grew up. His father was a farmer. I will be publishing more of Hammerhead's stories and history here as I complete more research for his personal and also his family history. I want to do genealogy research for the book as well as including the stories Hammerhead told me about the "old days". I also have photos I took and diary entries of various things we did together that I intend to use. I will eventually publish the book with Bookemon as a hard copy book, but I am going to publish it on this website also so that I can include the photos and videos I took. Hopefully, some Hemmerleins may see the posts and get in contact with me, or even if they don't, they may see Hammerhead's photos and want to download them to keep. Well, this about finishes the blog for this month except for the diary part. I had a little more I was going to post, some photographs of May Pop flowers and also some research I did on them, but I've about posted as much as I'll have room for this month, so I will save them for next month. I am still trying to get some material ahead for future blog posts. They will be better to use in May anyway, since May is when the May Pop flowers come up. It has been a cold wet spring so far this year, with no signs of warming up soon. It was only 37 degrees this morning and probably will not get much above mid 40's today, especially if it remains cloudy. We have had one chilly gray day after another for weeks now, with only occasional sunshine. Every night there is rain, stopping sometime in the early morning hours, to remain gray and chilly all day, with more rain the next night. I have some seeds, tomatoes, peppers, passion flowers, parsley, cone flowers, hard white daisies, pink plants, and sunflowers started in pots in the kitchen. But they are not getting enough light and not doing well. The poor little sunflower girls came up quickly, but never did get more than their two baby leaves. Every day they got a bit paler and weaker and finally dried up. I took them out to the "flower cemetery" (the compost pile) yesterday and replanted more seeds yesterday. If the sun doesn't come out soon, they won't survive either, though. I have all the flower pots in two plastic carriers to carry where there is sun each day, but there is no sun to carry them to. All the outside wildflowers are coming up, though, and the forsythia bushes are covered with green leaves. There are no leaves on the trees yet, but the bushes are getting a little greener everyday. So spring will come eventually. I walk in the yard and up the alley to get more flower photographs and see what new flowers are blooming nearly everyday. The dandelions are blooming later than they did last year, but there are a few more of their golden blossoms each day. I have taken lots of good photos of them and also some short videos. When I get time I am going to start posting some of my flower videos on YouTube. When I do I will post the link on my blog. 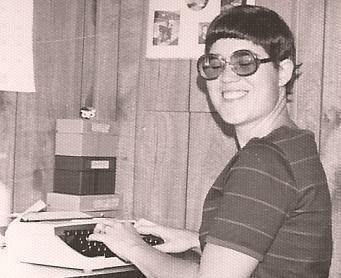 I finally got the next two chapters of Mariette's book typed and proofread so next month I will be able to start posting Nightmare House chapters again! Next month's chapter will be "Jack Simpson: The Dark Store". If you have been reading the story so far, you may remember that Jack Simpson is one of the three neighbors who found old Simon LaGrange frozen to death in his house after a blizzard thirty years before Curt and Mariette bought the old house and began restoring it. This next chapter will be Jack Simpson's first chapter told from his viewpoint. He owns the grocery store in Old America near Carrollton Location. In the original chapter that I wrote, his chapter and also the nightmare scene, where he dreams about his own out of business store, were one chapter. I have broken them into two chapters now, the description of his store and developing Jack Simpson's character more, in the first chapter, to be published next month, and the nightmare scene to be published in June. I have also expanded the nightmare chapter. In the original account only Mariette and Jack Simpson shared the nightmare of his store boarded up and out of business. In the new version Nettie, Mariette's mother, and Simon also share the dream, as well as Miss Dunbar and the Red Dog, in Auto City, Thomas Frostman, in Libertyville, and Fred Woodby, down in Paradise County, Tennessee. This change will keep more of the characters, who have important parts, in the story even when they do not have whole chapters. Also it will, I think, make the story increasingly creepy, foreshadowing when the nightmares start to come true, and the line between nightmare and reality blurs more and more. As the story progresses, the past is slowly returning and these chapters will foreshadow that more. Simon also, who was only a ghost in the original book, will become more real as Curt's and Mariette's restoration of the old house also begins restoring the long vanished past of Carrollton Location. 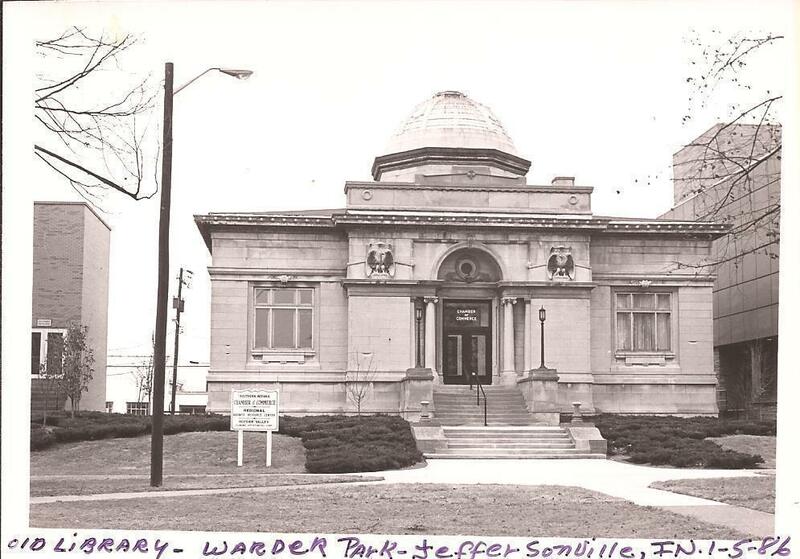 I am not sure about this yet, but Mariette has just told me that as the vanished past of Carrollton Location and Simon become more real it may even be possible for Nightmare House, besides being a ghost story, to also be a time travel story. She isn't quite sure about that yet, but, with Simon's help, she may be able to travel into the vanished past of Carrollton Location when the old house was new. I know Simon would like that particular plot twist to become part of the story because he now believes that Mariette is restoring his past for him, and his gratitude to her for this knows no bounds. He is already thinking that when the past is restored he may even be able to marry his long ago girlfriend who left him so many years ago for someone else, and that maybe his mother will also be restored to him, and they can all live in Carrollton Location again forever. So there isn't much he wouldn't do for Mariette, or give her if he thought she wanted it. I don't know much about this plot development yet, and Mariette isn't sure yet, so I will have to wait until we know more about this possible interesting development in the story! So until next month, here is one more photograph for you. This is of one of Gain's rabbits. 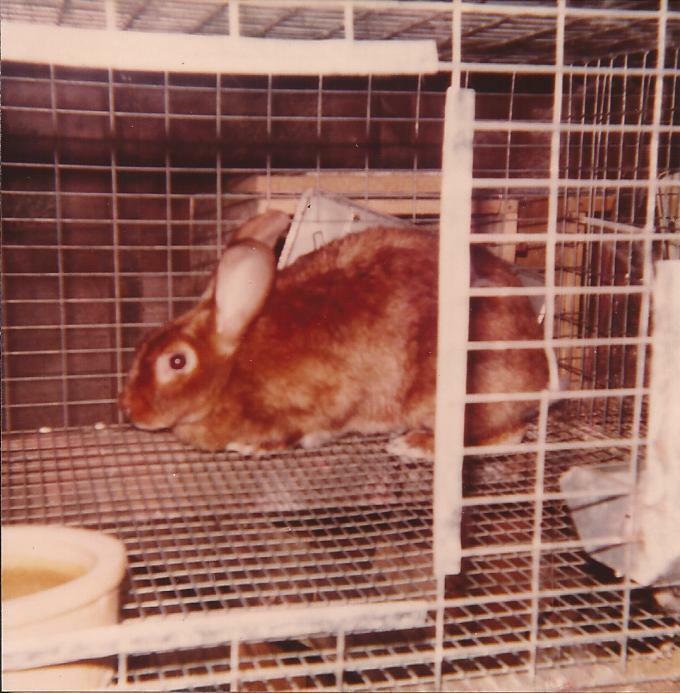 There is no date on this photograph, but I also have Gain's original rabbit raising book and accounts in my diaries that I may be able to look up and place the approximate time Mama took this photograph. She always enjoyed looking at and petting the rabbits when she and Daddy came up to visit us. 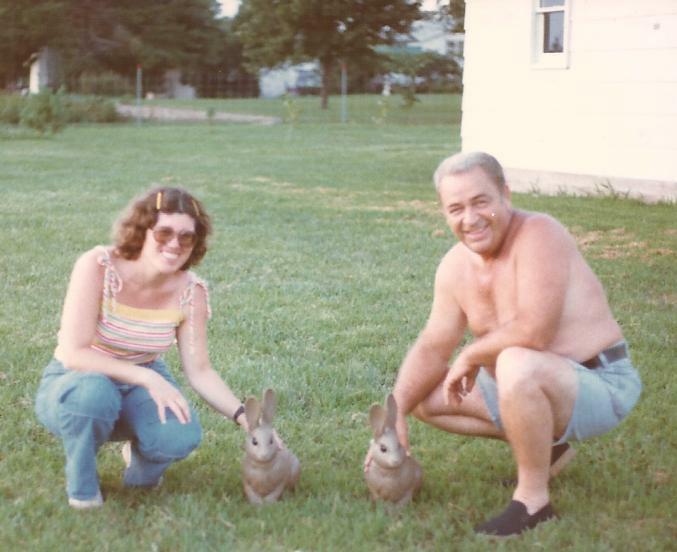 This photo was "her" rabbit that she named or else Gain named after her. Anyway, the rabbit was named Hazel. I have not proofed this blog yet, and it is getting late enough (after 3 o'clock in the afternoon) that I am going to take a break before I do that, so if you find mistakes, it hasn't been proofed yet. I will post a brief notice before closing out the diary later letting you know that the blog has been proofed and is finished. Thank you for reading my blog. I hope you find something you enjoy reading this month. If you want any of the photos download them and share them as you like. 8:30 P.M. now and the blog post is completed! I proofread it twice, once in manuscript form and once in published form, and also checked the links. It looks fine, so I am considering it officially completed for this month! Hope you enjoy reading it. Besides returning to publishing more chapters of Mariette's book next month, I also plan to continue publishing more of Mama's and Daddy's writing, as well as sharing some of the research I am doing on various subjects, along with links to look up more if you are interested, and, of course, lots more photos. Thank you for reading my blog. One more thing I almost forgot to mention. Mama's guest blog post, published this month, was originally published on Writers-Network on May 10, 2016 and is still on my page there. Daddy's letter is previously unpublished.